Trenchless Sewer Pipe Replacement The future of sewer pipe replacement is here today with our state-of-the-art equipment using high-density polyethylene (HDPE) sewer pipe, 6” lateral installed by 2 methods, the new Trenchless as well as excavation. 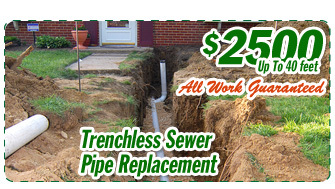 Now your sewer pipe can be replaced in a fraction of the time, without digging up your driveway, yard, or patio...and without digging up the old pipe! The HDPE pipe is able to retain its circular shape even when bent on a 4-foot radius during and after installation. Advantages of corrosion-proof HDPE include heat-fused “zero-leak rate” joints, smooth interior with a high-flow factor, zero root intrusion, and earthquake and ground movement resistance. It also flexes and bends, allowing up to 45-degree turns. We dig a pit where the main exits the structure and another pit where the pipe transitions from 4” to 6”. We run a steel cable through the old pipe, fuse together 20’ sections of HDPE pipe into the desired length. At this time, a large cone-shaped hardened steel breaker head is inserted through the pipe and is pulled by hydraulic rams, splitting the old pipe and creating a channel large enough for the new 4” or 6” HDPE sewer pipe. We connect it at each end, add cleanouts, fill the pits, and patch the asphalt or concrete. We replace 4-inch to 4-inch, 4-inch to 6-inch or 6-inch to 6-inch sewer laterals with our trenchless pipe bursting system. Cal Green Plumbing is a Bonded Sewer Contractor in the City of Los Angeles.